A Three-Hour Design Charrette Showdown. Adobe Creative Jams are an event series consisting of inspiring talks, plus a design competition, featuring local creative talent. With a focus on UX Design, teams were given the theme "Don't Panic" at 5:30 PM and had 3 hours to come up with a concept, design, and prototype using Adobe XD before the clock stopped at 8:30 PM. Anxiety disorders are the most common mental illness in the U.S., affecting 40 million adults every year. Though common, panic attacks can also be completely debilitating and come on at any moment; in a grocery store, on the bus, at home, or in a crowded concert venue. It's a real problem that doesn't always have a simple solution. Our mission was to create that solution... in three hours. Create… an app in three hours, following the theme: "Don't Panic"
And improve… their experience with mental health. The theme "Don't Panic" hits very close to home for me and my teammate Paige. We both struggle with symptoms of anxiety and panic, and will often text each other daily reminders just to breathe. That being the case, we knew we needed to take the "Don't Panic" theme and focus on mental health. We started with a one-minute sticky note exercise. Here, we wrote down as many remedies or solutions as we could for preventing and treating panic/anxiety. The largest group of stickies from this exercise focused on grounding and re-centering techniques *during* a panic or anxiety attack. 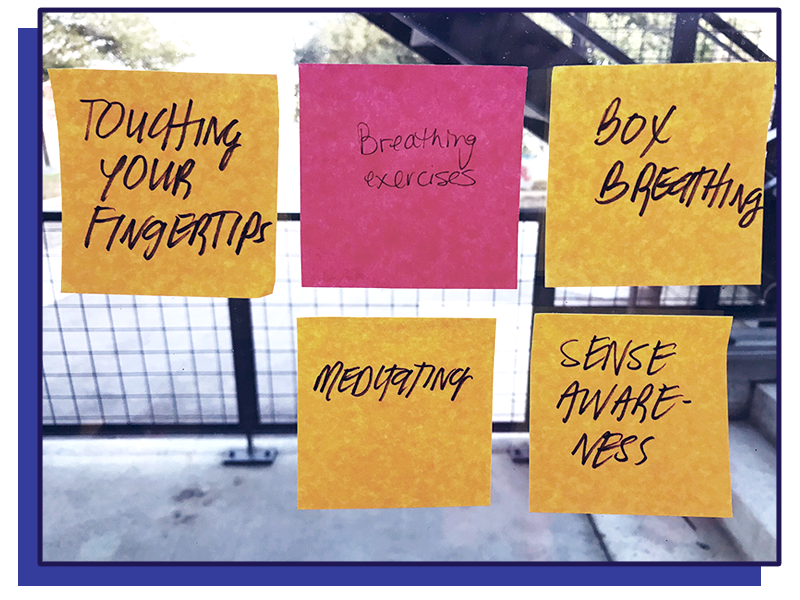 Then, we took our sticky note exercise a step further to really capture the experience of panic and anxiety; when it starts, what it feels like, and how someone might be successful in pulling themselves out of it. For one more minute, we wrote down the "story" of a panic attack starting with zero symptoms, all the way up to peak panic, and then back down again to zero symptoms. This exercise helped us unanimously agree to tackle the "peak panic" phase of a panic attack, while focusing on the fact that panic can set in just about anywhere. We had our focus: create a solution to calm panic as it's happening (especially in a public place). But before jumping in to design, we wanted to see what apps already existed in the realm of mental health and meditation. Through our research, we found that most comparable apps (Calm, Pacifica, and Headspace) were focused on meditation and long-term mental health rather than calming panic and anxiety *as* it's happening. The Headspace app was the closest solution we found to the problem we wanted to solve (calming down in the moment) with mini exercises to help its users breathe and re-center. However, Headspace still requires audio capabilities and works best in a private setting; not helpful if you're feeling panic symptoms in the middle of a crowd. It was important that users could use this app in a public space without headphones. This fact forced us to significantly narrow our scope and pair down the types of media and content this app could offer. After briefly researching popular grounding and re-centering techniques, we found that if we focused on the five senses it would be easy for a user to quickly (and subtly) bring themselves back into their bodies and "alleviate" their feelings of panic and anxiety. Before moving into Adobe XD, we outlined the necessary screens and what should be included on them (see notes above). Adding this step helped our final design phase move along quickly and smoothly with minimal iterations. We started the final design phase by quickly scanning sites such as Dribbble and Pinterest for design inspiration, then agreed on a brand and design direction. We wanted the app to be simple and focus on the task at hand, but also friendly, colorful, and modern so users felt they were getting the support they needed without the stigma. In total, we spent about half our time (1.5 hours) defining the problem, researching, brainstorming, and thinking through our solution. The other half of our time we spent designing and prototyping our app in Adobe XD (and creating silly nose/eye/hand/ear/mouth images in Photoshop, of course). Finally, the Alleviate app is born! Alleviate helps people center and ground themselves during moments of panic by reconnecting them with their surroundings via their five senses; particularly in crowded, public spaces. Once the user opens the app, they can start a 5-minute calm-down where they focus on each sense for a full minute. The app includes a timer, start/stop button, and an option at the end to run through it again if necessary.